This was made for Song of Destruction. Class up your Game-Over screen! # This class performs game over screen processing. s2 = "Return to Title"
# If continue is enabled, move cursor to "Continue"
Will most probably not work with other scripts that override Scene_Gameover. As always if you find a bug, you know the drill. The permanent solution for your problem would be to stop hanging out with stupid people. $game_system.map_interpreter.setup(nil, 0)before you setup the map. It resets the interpreter so that events don't get stuck. Key Term does not exist. I really couldn't have done it without winkio and G_G guiding me every step of the way. 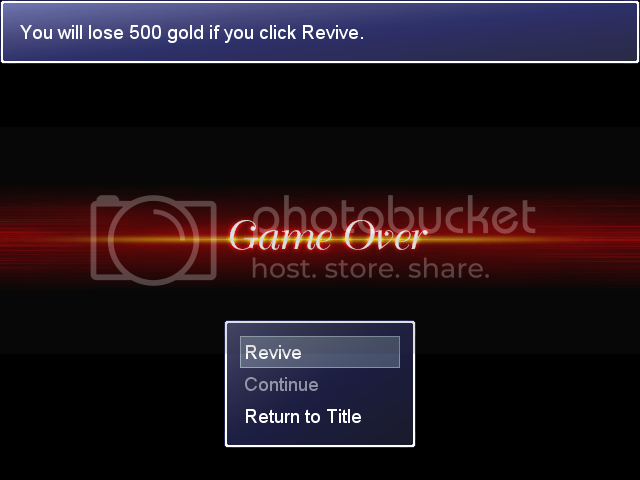 Nice, but it seems as if it would cost 0 gold to revive if the player dies with no money...kind of cheating death? You have to set the variables to the map id, the x, and the y coordinate of where the player is placed after being revived. This makes it so you can revive in different towns throughout the entire game. Oh I see it now.